Marvel Heroes and its Omega upgrade, were a grand effort. When developer Gazillion Entertainment first launched it as a PC-exclusive several years ago, it was a diamond in the rough. It wasn’t perfect by any stretch of the imagination, but it still had a solid foundation that could be used for further enhancements. Said enhancements were slotted in aplenty, with Marvel Heroes growing with new gameplay additions on a monthly basis at one point. Free to play, offering a taste of everything that it had before it asked for some cash in return, Marvel Heroes was a great game to spend a few idle hours on. Marvel Heroes omega was meant to be the start of a new chapter for the game, one that brought its action to consoles with some handy dandy control schemes that simplified the action. Instead, it was a swansong as Disney pulled the plug on Gazillion Entertainment and their access to the pantheon of heroes and villains. Originally scheduled for demolition at the end of December, giving players time to say goodbye and experience the game without the need to purchase anything else, Gazillion has instead closed up shop sooner than expected. A damn shame, that’s what it is. The fact that this was done to the staff before they could celebrate the Thanksgiving holiday properly is bad enough, but when you factor in that the crew got zero severance payments as well? 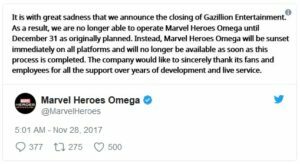 If there’s any anger to be directed at Marvel Heroes Omega, it needs to be channelled at the people in charge who were responsible for mismanaging the title and letting their crew of hard-working developers take the brunt of this monumental stuff-up.